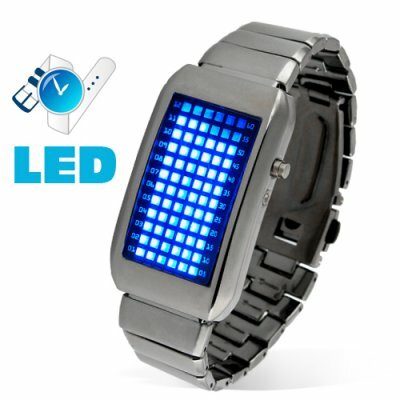 Successfully Added The One Kelvin - Japanese Style Mid-Sized Blue LED Watch to your Shopping Cart. Say hello to the One Kelvin, a smaller mid-sized version of our popular Zero Kelvin blue LED watch. The One Kelvin is a timepiece from the future which evidences the crux of cool by modulating how we tell time. You mean this watch really tells the time? Yes. Even though The One Kelvin embodies Eulerian style and Escherian design with its ethereal blue LEDs encased in carbonate hues (like charm quarks inside D mesons interacting with the strong force! ), this blue LED watch does in fact tell the time and does so really efficiently too! Tap the display button on the right side of the timepiece and watch the screen light up. There are 72 blue LED lights on the watch face. The first 12 LED lights display the hour. The other 60 LED lights display minutes. How's that for MIT-errificness! Splendificent to gaze upon, this blue LED watch looks like it just stepped out of Warehouse 13 or a William Gibson novel. Make no mistake about it though. You needn't be Darkseid or a silver surfing herald in search of worlds for his master to consume to wear this watch. In fact this watch is perfect for your average Akihabara cowboy, Doraemon fan, Samurai turtle, Assembly programmer, grammar particle physicist, or anybody who is a somebody. Why is this watch called The One Kelvin? Because the original larger version was called the Zero Kelvin. Also we imagined that the type of person who would wear a watch like this would be able to bend the laws of Physics as well as manipulate and reshape the Matrix as he saw fit. You mentioned that this watch is perfect for your average Akihabara cowboy, Doraemon fan, Samurai turtle, Assembly programmer, or grammar particle physicist. What if I don't belong to one of these groups?This watch is also perfect for Aerosmith fans, members of bands without record deals, students who have been in college for more than 7 years, members of the Mickey Mouse club, unappreciated waiters and waitresses, the yearbook committee, people who get up early on Saturday to watch cartoons, and Euchre players that call trump on the left bower, a ten, and strong partner reliance! Very solidly built really needs an adjustable strap I have seen these with different colour LEDS there should be more choice but very nice all the same.